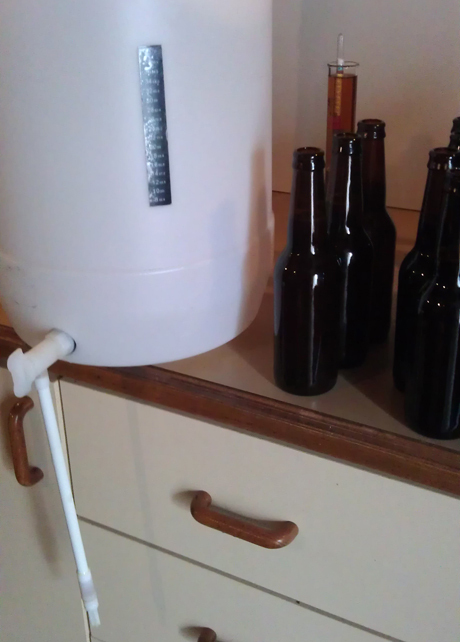 Sunday was bottling day for the Summer Ale. Was a fairly straight forward affair with just me doing everything, and all done in about an hour. The best thing was that I didn’t stuff the beer by acidently oxygenating it, like I did with the Super Stout. Given there was 14 litres of beer I decided to bulk prime. First time I’ve done it since making the mistake with the Super Stout. I took my time and planned it out better. The only hiccup I had was when the end if the bottling wand feel off into one of the bottles. Learning from that time that happened, I quickly turned off the tap before losing to much. No other problems. The sample I took had a gravity reading of 1.005 which is lower that I had hoped. But in a good way. 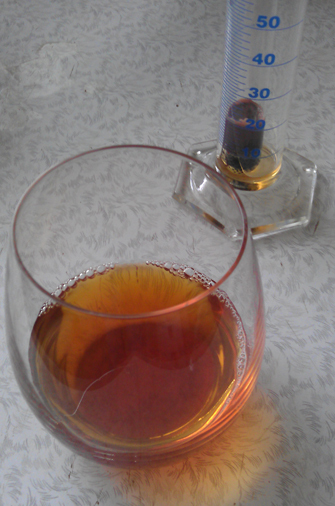 After original reading was so low I wanted the final gravity to be under 1.010, and here we are a bit under that. Happy with the outcome. There was a nice tropical and earthy flavour to the sample. The colour was a fair bit darker than I thought it would be. Both those have me thinking that I’m sure if I would call it a Summer time beer. After a couple weeks I’ll crack open one and find out. On a side note, have found that my hydrometer has a very fine crack in it and some liquid has got in. Not sure if that was before the reading of the original gravity, final gravity or just in clean up. Needless to say, I’ll be using the spare one for next brew and buying (another) new one. I finally got around to bottling the Super Stout. I’ve been waiting for some extra fermentation which hasn’t really happened. I was by myself and made a mistake. I knew at the time that maybe it wasn’t a great idea and did it anyway. The gravity reading on the stout hadn’t really dropped from the reading I took three weeks ago. Back then it was 1.031 and it finally ended at 1.028. That’s not a lot of movement over three weeks. The extra temperature may have helped ferment a bit more, but not sure if it was really worth the extra wait. 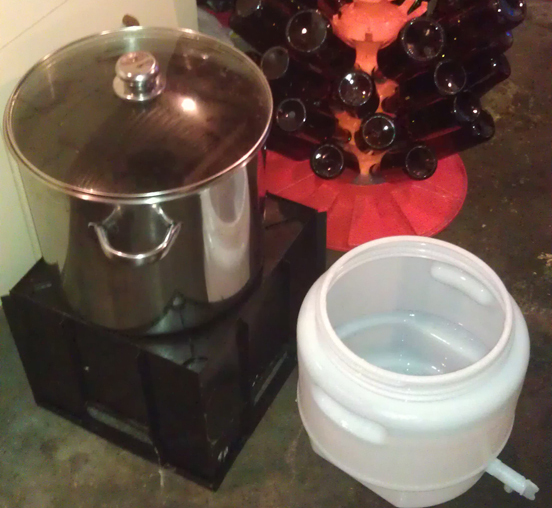 Bottling 18 litres of beer by myself was never going to be fun. That’s one of the reasons I had put it off for so long. 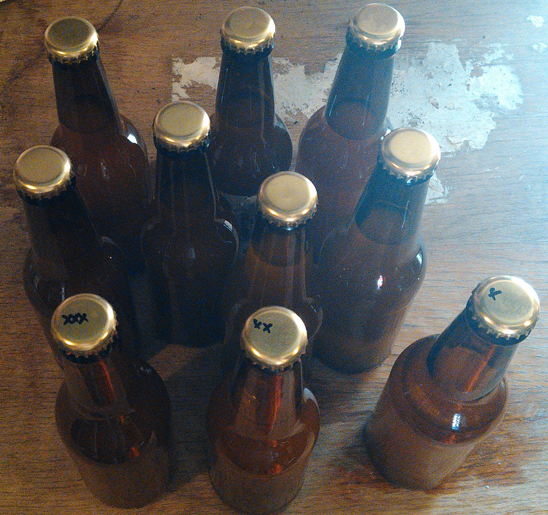 I wanted to put most of the beer in 330 ml bottles as well which was going to drag it out longer. My bottles are washed and clean before I put them in storage. All I needed to do was sanitise them and put them on the bottling tree to dry a bit. Pretty straight forward once I put the rest of the bottling tree together. I’m use to bulk priming I didn’t want to go back to individual priming. That meant I needed to measure the take sugar and dissolve it in a little bit of water. That was simple. 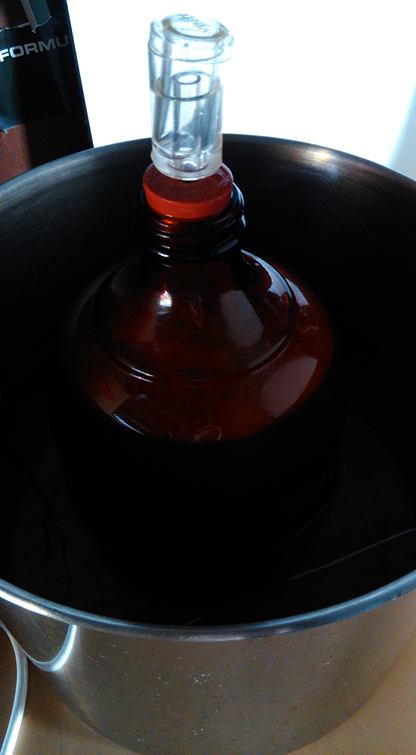 I had the dissolved sugar in my new(ish) 19 L pot and racked off the beer from the fermenter to the pot. That went really well. Now I had all my beer primed and ready to bottle. And in a huge pot. How to bottle from here? I could syphon it out one bottle at a time. That would take forever and I didn’t have the time. I could transfer to one of the fermenters with a tap and use a bottling wand. Not the big one as I don’t have time to clean. Little one is good to go, but a bit small. Split it into two lots would work. What’s the easiest way to move it from the pot to the small fermenter? A siphon us a smart choice. But what did I choose? Pour it in. What was I thinking?! There was a but of a mess when I poured the beer out if the pot. Most went into the fermenter. Lost about 500 ml to the floor and side of the fermenter. Second lot was less messy. The real problem is that by pouring the beer it got aerated. And according to John Palmer’s book How To Brew that it’s likely going to produce diacetyl flavours. Not good. 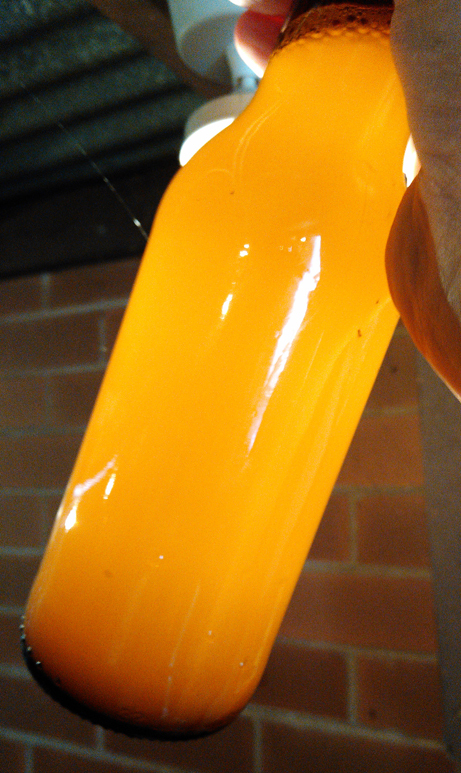 The rest of the bottling went pretty well. I did under estimate how many bottles I would need. Total count was 35 stubbies and eleven 500 ml bottles, a total of just over 17 litres. After bottle conditioning the alcohol should be 5.2% which is below what I would like for something called a Super Stout. Would expect something close to 8%, but I knew from the original gravity that want going to be possible. I didn’t taste the beer when bottling. I had tried it a few times with the gravity samples over the past few weeks. Quite dark and the liquorice flavour changed enough for me to notice between sample one and the last one. There was a good hint of apple aroma from the beer once primed and in the open pot. I really hope that doesn’t come through in the beer. I’ve included what temperature settings were used. You can see that I raised the heat a fair bit in a futile attempt to ferment more sugar. I’m fearful that it might have caused a negatively effected the beer. If you’ve got any feedback on the above is love to hear it. Both the temperature changes and the pouring/aeration of the beer. It’s been three and a half weeks since the brew day for the Super Stout. I deliberately left this to ferment at a lower temperature, 16 degrees Celsius. There were two reasons for that. First, Good Beer Week was on last week and there was no time over the weekends to bottle. Second, wanted a really clean yeast finish to the beer. Fast forward to now. Went out and took a sample of the beer. 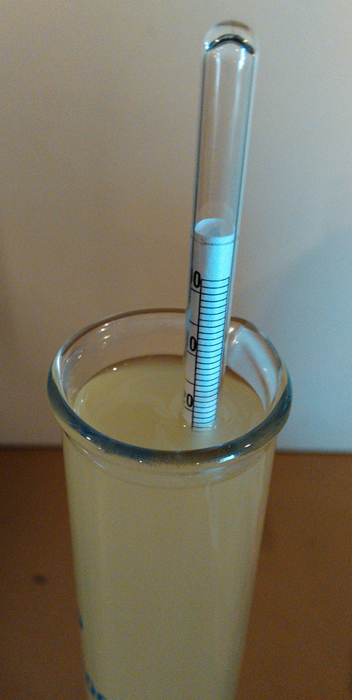 Gravity reading came in at 1.031! What? I’m pretty sure that’s no where near where I thought it would finish. Yeah, there’s all sorts of stuff in there like lots of super dark malt and liquorice. But I really thought this would drop more. And I still do. Rather than wait another 2-3 weeks I’ve set the temperature to rise to 20 degrees Celsius. I’m hoping the yeast will wake up and have another crack at eating some of that remaining sugar. If that doesn’t work, I might need to pitch some more yeast in. Which is something I’m not took keen on. The sample tastes quite sweet still. And that should mean there’s still more sugars for the yeast to eat up. There’s also a really strong molasses taste which ends with liquorice taste. Now I know what the liquorice does. The sample is also super dark, just as the name suggests. So, temperature up and give it another week and a half. Hope it’s ready by then. If not… well, we’ll cross that bridge if we come to it.